Safe and Innovative Products, On Time. 1. What is the safe operating temperature of hoist rings? -20F to 400F for alloy steel and 800F maximum operating temperature for stainless steel For temperatures lower than -20F, please contact the ADB engineering department. 2. Can hoist rings be used for fall protection? Yes. Typically a 10:1 factor of safety is required but make sure you refer to your local and state safety and fall protection regulations regarding capacity requirements. 3. Can hoist rings be made with special threads? Yes. ADB can customize any thread length or type to meet order specifications. 4. Can I go through a plate and put a nut on the end? Yes. ADB recommends using ADB provided nut and washers for through hole applications. ADB can also customize the bolt / thread length to pass through plates or through holes. 5. How frequently do I need to inspect Hoist Rings? It depends on the application. Refer to ASME B30.26-Rigging Hardware, for reference. 6. How many times can I torque the bolt before I need to replace it? 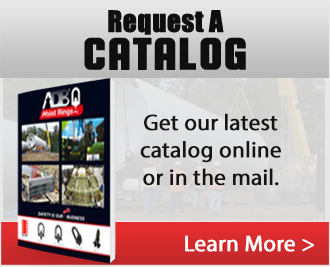 ADB hoist rings do not require enough torque to cause any permanent deformation. 7. How short can you make the thread and still maintain the capacity? It depends on the tensile strength of the mating material, provide ADB the tensile strength and we will tell you the minimum engagement. 8. What happens if I shock load the unit? Any unit that is shock loaded must be taken out of service as this may have caused permanent damage and must be inspected by qualified inspector to determine if it should be replaced or can be reused. 9. Can hoist rings be galvanized? We can cold/mechanical galvanize. Hot dipped is not recommended as it requires approx. 450 degrees F to apply. 10. Does the rated load have a design factor? 11. Is the rated load in all directions? Yes. Hoist rings retain its working load limit capacity from 0-90 degrees. 12. Can I put a spacer underneath the hoist ring? No. 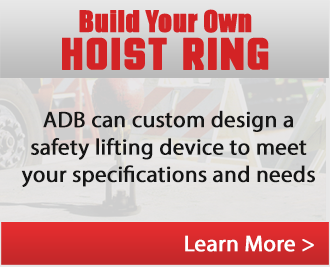 ADB can customize a hoist ring to meet requirements to meet clearance situations. 13. What is the material of the hoist rings? 14. What plating options other than standard Black Oxide do you offer? 15. How many times can I use a Hoist Ring until I need to replace it? This depends on the severity of use. However they are tested and designed to meet 20,000 cycles under normal operating conditions. 16. Does your product come with a certificate of compliance? A standard certificate of compliance can be added upon request. Our standard certificate specifies the material properties, design factor, inspection and industry standards and is available at www.adbhoistrings.com. If there are any special inspection or testing requirements you must specify what type of certificate you’re looking for. 17. Does each hoist ring get proof tested? ADB proof loads test *each hoist ring to 200% of its working load limit and it is held for 3 seconds. (* Hoist Rings up to a WLL of 30,000 lbs.) Any hoist rings with a WLL above 30,000 lbs. can be load tested upon request and are considered a special order. Stainless Steel orders are proof load tested to 150% of its working load limit and it is held for 3 seconds. Any unit needing different load testing requirements can be ordered as a special. Each hoist ring proof tested is tagged with the certificate of proof test on the units attached product label.